On Saturday the 61 teams were greeted with an ever-building breeze, reaching gusts of 41kts. This meant that despite Chichester Harbour being bathed in beautiful spring sunshine, Saturday was blown off. With the clocks going forward and Sunday's racing also being brought forward an hour, everyone was in for an early start. Sunday's four-race series began with glamorous sailing conditions: wall-to-wall sunshine and 15kts. Each race provided different challenges to test even the best sailors: choppy Solent waters, fluctuating breeze and powerful tides. Those sailors who could quickly get their heads around the conditions made it to the fore. The event concluded with 20 boats being black flagged on the last race, reducing the size of the fleet considerably and providing the chance for some less experienced sailors to get some good results. Team Dylan Squared, Dylan McPherson & Dylan Collingbourne, took the win by an impressive margin to retain the Spring Championship trophy. After the racing we caught up with Dylan McPherson to get his take on the day's racing: "We dealt well with the pressure of being defending champions and sailed well. It's a great lead-up event to the World Championship and practice to get in. With no racing on Saturday we went for a walk and got through a few ice creams, then got out early on Sunday. We started off with a third, then had two firsts after that, and discarded the last race where we finished 10th." Crew Dylan Collingbourne enjoyed the fresh conditions, "It was a tiring day; I just want to fall on the floor like a pile of jelly! Being the heavier there was a lot of hiking in these winds to keep the boat flat all the way up the beat. Many thanks to Allen for all the help they give us and coaches Jonathan and Flynn in the Burnham Squiddies; we wouldn't be where we are today without them. This win really helps build the confidence, ready for the Nationals and the Worlds." 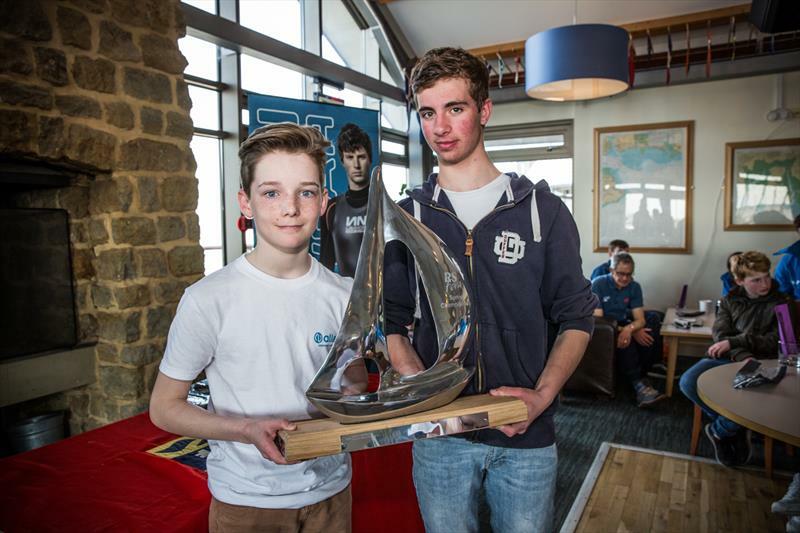 On their main competitors McPherson said, "Tom Storey and Ollie Kent were sailing very well, but were black flagged in the last race. There were some great battles on the water. It was a good fleet and gave us great competition. Next up is the Grand Prix at Yorkshire Dales."